Today, Google launched “Pages” for Google+, to let you connect with people, places and things. The feature has been long-awaited and discussed, since Facebook has had Pages for businesses, organizations, and people for some time. Even though the Pages feature might be a bit of catch-up playing, it’s a welcome addition to the Google+ platform. In life we connect with all kinds of people, places and things. There’s friends and family, of course, but there’s also the sports teams we root for, the coffee shops we’re loyal to, and the TV shows we can’t stop watching (to name a few). So far Google+ has focused on connecting people with other people. But we want to make sure you can build relationships with all the things you care about—from local businesses to global brands—so today we’re rolling out Google+ Pages worldwide. As an example, The Muppets have launched its own page to get people excited about its new movie on November 23rd. 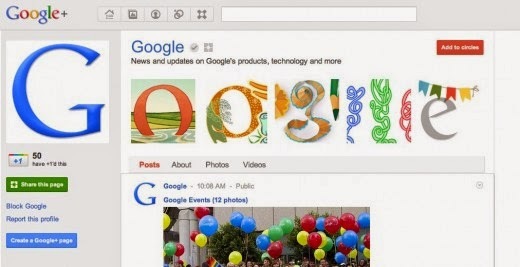 To get more of an idea of what a Google+ Page for businesses looks like, check out Google’s. Google also announced “Direct Connect” from Google search. Google+ Pages will now be found in search results, allowing customers to connect directly to businesses. People search on Google billions of times a day, and very often, they’re looking for businesses and brands. Today’s launch of Google+ Pages can help people transform their queries into meaningful connections, so we’re rolling out two ways to add pages to circles from Google search. 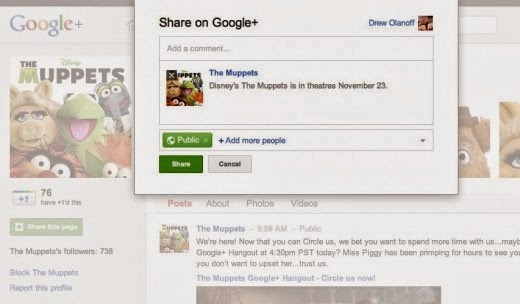 The first is by including Google+ pages in search results, and the second is a new feature called Direct Connect. Maybe you’re watching a movie trailer, or you just heard that your favorite band is coming to town. In both cases you want to connect with them right now, and Direct Connect makes it easy—even automatic. Just go to Google and search for [+], followed by the page you’re interested in (like +Angry Birds). We’ll take you to their Google+ page, and if you want, we’ll add them to your circles. Pages is a huge step in the right direction for Google+, since Google owns the majority of searches in the world by a huge margin. This gives the company a competitive advantage to provide companies direct access to consumers, in a way that Facebook can’t. Facebook is centered around interacting with your friends, while people who are searching on Google want to buy things and are looking specifically for companies to buy things from.